Cook pasta per package directions. Drain and set aside. In the same pot, bring 4 cups water to a boil. Add asparagus, reduce to a simmer and cook 7-8 minutes, until asparagus is very tender. Remove from the water and allow to slightly cool. In the bowl of a large food processor, blend asparagus, spring peas, Parmesan, pine nuts, garlic, basil, lemon juice and a generous pinch of salt and pepper. While blending, drizzle in olive oil until desired consistency is reached. Taste and adjust seasoning, if necessary. 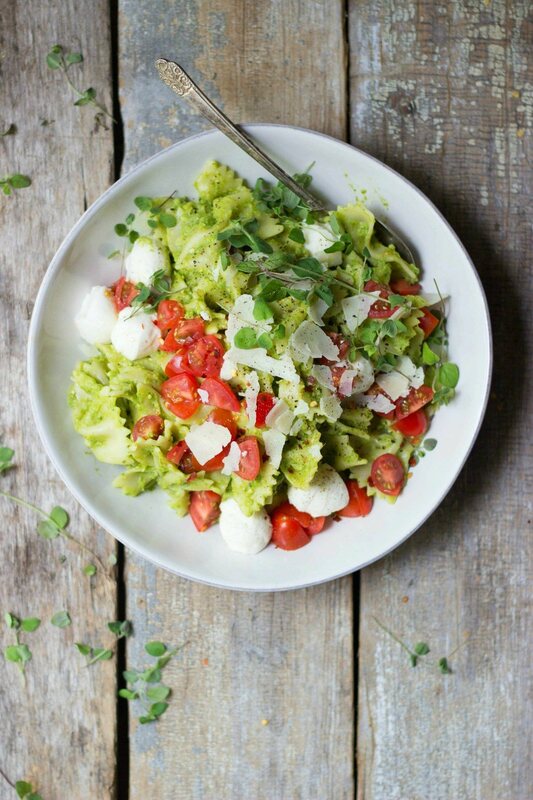 Toss asparagus pesto with bowtie pasta. Stir in tomatoes and fresh mozzarella. Refrigerate for at least one hour. If pasta is dry, toss with extra olive oil. Garnish with Parmesan cheese and basil. Serve.